Instead of admitting defeat—that its violent five-year Black Bear Management Policy is a failure—the NJ Division of Fish and Wildlife has stooped to an all-time low to interest hunters—releasing bear-hating propaganda to media recently about how good bear meat tastes and offering cookbooks. Friends of Animals (FoA) believes it is obscene that from Dec. 8-13, New Jersey hunters can lure bears with pizza, jelly doughnuts and other junk food in the woods before shooting them, just so they can turn their heads and hides into a rug or wall hanging. “The propaganda distracts from the real motive behind this trophy hunt—Gov. Christie’s blind allegiance to the National Rifle Association and wildlife agencies’ blind allegiance to hunters who generate revenue for them and the state,” said Priscilla Feral, president of Friends of Animals. FoA and supporters will stage an event near Gov. Christie’s office Dec. 4 to tell him to end this bear hunt for good (details to follow). “Cowardly hunters bait bears with junk food to easily shoot them—so we’ll be bringing vegan donuts and other treats to the State House in Trenton to prompt Gov. Christie into speaking with us and outraged NJ residents who want the slaughter of bears in their state to end,” said Edita Birnkrant, campaigns director. Just as appalling as disseminating bear meat recipes is the implication that the state’s “bear problem” is connected to a black bear killing a hiker last month. News reports indicate the hikers involved in the incident were inexperienced. Having said that, Tim Rubbert, author of Hiking with Grizzlies, is a strong advocate of carrying bear spray, as it saved his life when he was charged by a female grizzly with a cub and another time when he drove off a grizzly that was mauling a hiking partner. "One thing I've learned is that bears are not monsters," Rubbert told the Great Falls Tribune. "The biggest problem is surprise encounters." He insists that all bears, if properly warned by humans of their presence, will try to avoid contact with people. For instance, hikers should make noise when they’re coming around a blind corner or are in thick cover. They can also avoid a close encounter by learning about the kinds of vegetation that attract different types of bears and steering clear of it. And since black bears will sometimes eat dead animals, the last thing you want to do around a frisky black bear is lie down and act dead. “Stand tall, arms over the head. Make a lot of noise. Pick up a big stick. Don't attack a black bear, but fight back if a black bear attacks you,” Kanze said. Of course preventing conflict is key. Deprive bears of all human sources of food, and the situation becomes a lot safer. So not only is bear baiting despicable, it’s dangerous to the public. 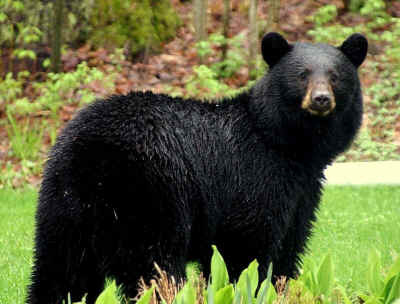 New Jersey residents need to know to never leave pet food outdoors, and if bears are around, do not put out bird seed. “Bears that have been fed associate human scent with food, and that's a dangerous thing,” Kanze said. We couldn’t agree more. That’s why wildlife officials should also make it mandatory for residents to use bear-resistant garbage cans—another solution to human-bear encounters the state has ignored. Instead they advocate for hunters, who buy licenses from them. Shooting bears is not the sane answer. Better education is. “Just like schools have fire drills, wildlife drills might also be a good idea. Kids need to know how to be as safe as possible. At our house, we teach our elementary age son and daughter how to act if a bear ever turns up and doesn't run away—as bears generally do,” Kanze said.